Can't believe it's May already, everyday is seem to go faster. During April I kept on using the same products, just to save as much time as possible, while doing my make-up in the morning. Urban Decay Naked Palette is just amazing for everyday eye make-up, I had hit pan on 3 eyeshadows. My favorite combination is Virgin all over the lid and then Naked in the crease. Rimmel Wake Me Up Foundation have been my lover recently, it's such a great foundation for daily use. I just love how creamy the formula is. MAC Studio Sculpt Concealer is my life saver, as my sleeping pattern is bad again. The Studio Sculpt concealer covers everything I need to be covered and it's last pretty much for the whole day. Avene Soothing Eye Contour Cream is one of my favorite under eye cream, I like to have my under eye area well moisturised. Isn't Models Own nail polish in Utopia the most pretties lilac grey? I just love it on my nails. 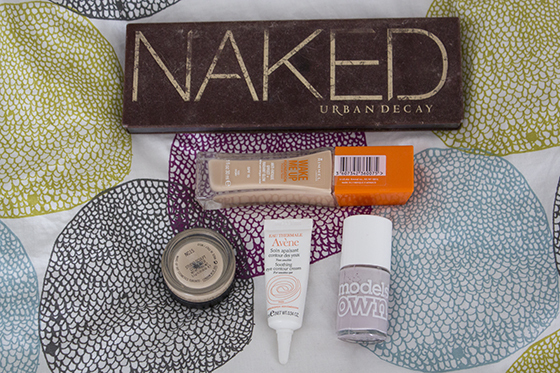 Naked is one of my all time faves! I also really like how the Utopia looks. Really want to try Model's Own Utopia, you've featured it so often!! i love the naked palette! I use Mac foundation and powder but I've never invested in the concealer. That nail varnish is super cute too, love lilac, perfect for spring! I seriously need that Naked palette. I hear so much about it and the colours totally look like my kind of palette. I tend not to comment, however after reading through some of the remarks on this page "april favourites". I do have a few questions for you if it's allright. Is it simply me or do some of these comments come across as if they are left by brain dead individuals? :-P And, if you are posting on other online sites, I would like to follow you. Could you make a list of the complete urls of all your public sites like your Facebook page, twitter feed, or linkedin profile? Thanks for sharing with us! I am using Avene Soothing Eye Contour Cream too since few weeks now and it does make my eyes and skin feeling more hydrate and elastic!